In spring 2017, Oregon's Mt. Hood Territory, the Destination Marketing and Management Agency for Clackamas County, initiated a comprehensive study to determine if the water assets in the county are being used to their greatest economic potential. A preliminary review of water-based tourism in 2016 found that there was a solid foundation for future development of new assets and expansion of current opportunities. The agency determined that water recreation has the potential to become a major tourism generator in the county – with the Molalla River and Canby offering some nice potential. "After evaluating the results of the 2016 review, the Tourism Development Council (TDC) made water tourism a central part of its five year (2017-22) Strategic Plan," said Danielle Cowan, executive director of Oregon's Mt. Hood Territory. "Water enthusiasts, especially those who like to fish, spend money to travel for their activities. The rivers and lakes of Clackamas County are some of the best in the country and provide outstanding opportunities for water recreation. Our county has the ability to draw visitors to enjoy our water recreation, even during the off season which is often a struggle for businesses and local communities that depend on visitors for their livelihoods." However, converting these natural resources into sustainable tourism assets requires strategic planning to develop products, target niche user groups and still maintain the health of the area's natural resources. To conduct a further in-depth analysis of these issues, Mt. Hood Territory hired Michael Crane of Crane Associates, a leading authority in sustainable water-based recreation. "Michael Crane is an environmental economist with more than 20 years of experience in sustainable tourism," said Samara Phelps, destination development lead. "He brought not only the technical expertise to collect and analyze the data needed for this assessment, but also a breadth of national and international experience. His perspective is an extremely valuable resource in creating our water tourism strategic plan and for local partners currently engaged in water related projects." While performing the study, Crane Associates worked with dozens of stakeholders from the public, private and non-profit sectors to fully understand the area's water assets, analyze the market demand for water-based recreation in all its forms, identify any untapped market opportunities, and create strategies to capitalize on them. Through his research, the Willamette Falls and the Locks were identified as having huge potential for tourism, but because of the amount of work already dedicated to planning and projects within the Falls area, Crane focused the study on the other water assets in the county. The study includes more than three months of site visits to Clackamas County's water bodies and surveys from 1,700 statewide respondents. The results represent the interests of 1.6 million water recreation enthusiasts and a detailed inventory of the county's recreational assets. • Oregon's recreational waters are visited 80 million times annually by people looking to recreate. • Clackamas County's recreational waters attract 1.5 million visitors annually, which result in 240,000 overnight stays. • Clackamas County's water bodies are equally good or better than the state average for recreational value. • The public's concern for water quality, habitat quality, public access, information, safety, user conflicts and crowds are not significantly different in the county than the rest of the state. 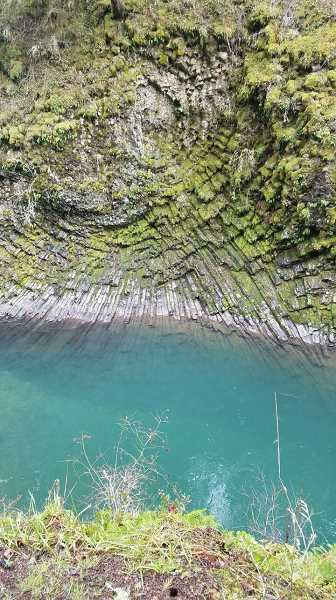 • Water-based recreation generated about $12 million in lodging reservations in Oregon in 2016, but Clackamas County captured only about 2 percent of this amount. Despite above average water assets, the county is attracting below average visitation to these waters due to a combination of physical access, water-recreation management, lack of awareness, and niche product development. Communities throughout Clackamas County have an opportunity to create recreational assets through their connections to rivers and lakes. Consultant Crane identified numerous strategies throughout the county and in local communities that would enhance the potential for water-based recreation as an economic development tool. Crane identified multiple opportunities for Canby to better connect to the Willamette River. He suggests water access improvements at Molalla River State park and hiking trails from the park to Main Street would benefit the community by leveraging visitors on the nationally designated Willamette River Water Trail and create a stronger connection between the river and the community. Creating camping opportunities at Molalla River State Park would address unmet demand for camping in the Willamette Valley and generate overnight stays. Crane's study notes the high quality and diverse recreation opportunities, surrounded by the beautiful settings available along the free flowing Molalla River. The Bureau of Land Management estimates that 50,000 annual visitors recreate in the Molalla River Recreation Corridor, participating in rafting, kayaking, hiking, picnicking, swimming, tubing, mountain biking, horseback riding, camping, hunting and fishing activities. These activities illustrate the proven demand for recreation along the river, but also the capacity to accommodate more visitors. Crane found that the recreation opportunities and connection to the river would benefit from facility improvements to existing sites including needed repairs, interpretation signs and access for the mobility impaired. He suggested the removal of the blockage at Elisha Park to improve river safety. Opportunities to increase the number of days camping is available through coordinated management between the land managers and community groups were also identified. "We are committed to developing and maintaining Clackamas County as a sustainable tourism destination with vibrant local communities," said Cowan. "Together with industry stakeholders, residents, local organizations, and government partners, we have the opportunity to lead the state in the improvement of water-based tourism." Acting on the opportunities presented in the study relies on community coordination and engagement. Michael Crane will return to the area in October for discussions on water tourism with groups working on related recreation projects and interested citizens. To incentivize investment in water-based tourism, Oregon's Mt. Hood Territory is devoting a significant portion of its $250,000 in Tourism Development Grants for 2018-19 on such projects. Grant recipients will be announced in December. The complete study, links to community specific summaries, and event details can be found at: https://www.mthoodterritory.com/water-tourism-strategic-plan. > Community Presentations On Oct. 11 and 12, Clackamas County Tourism will host presentations and a discussion on water asset development in local communities.